On day one, taking the ferry to Alcatraz will afford you amazing views of the Golden Gate Bridge, Angel Island, Alcatraz Island, and the San Francisco city skyline from the north. When you land on the island, you’ll get a short history of Alcatraz, and then head up into the prison! On day two experience redwoods, hiking, and world-class wine, beer and cheese. Experience all this and more on a day trip to Muir Woods and Sonoma wine country. Pass through the beautiful Marin Headlands on your way to Muir Woods National Monument, where you see some of the West’s most beautiful redwood trees. In the afternoon, relax in Sonoma Valley wine country, where you will enjoy wine tasting at a variety of fine California wineries. This full-day tour is a fun mixture of nature and culture. 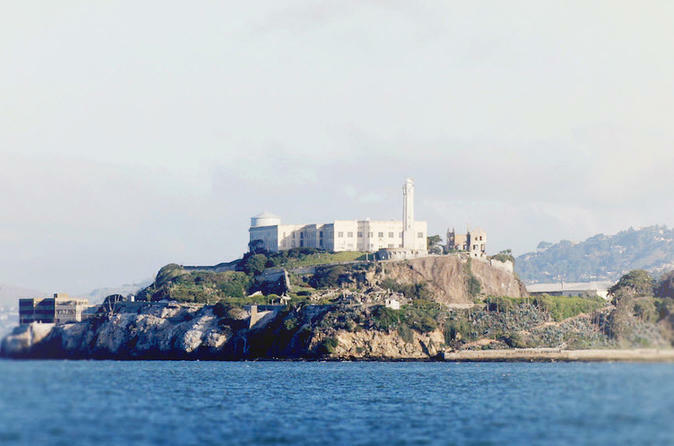 See Alcatraz Island and learn the history of “The Rock” with a 3-hour ferry and audio tour of the island and prison. Spend the rest of your free day exploring the Aquarium of the Bay! Cross the Golden Gate Bridge and pass through the beautiful Marin Headlands on your way to Muir Woods National Monument. You’ll spend over an hour strolling among some of the tallest trees in the world, the Coastal Redwoods. Snap some photos or wander through the misty paths and marvel at these amazing giants. Continuing north, you’ll stop for lunch in Sonoma Square, or have a picnic lunch among the vines! In the afternoon, enjoy wine tasting in the Sonoma Valley Wine Country at a variety of small-to-medium production wineries. At the end of the day you’ll arrive back at your hotel in time for dinner! When you exit the vehicle, you’ll get a gift to take home: a bottle of wine, and a custom-printed tote bag.